In a world where the perfect Instagram photo is more valuable than a souvenir from a vacation destination, the value and importance of a good customer experience have skyrocketed. Anyone has the power to tweet a bad experience to the world. People and businesses are watching. Entire organizations are restructuring to cater to the customer experience and major investments to improve the customer journey are being made across all industries. The shift in market research towards customer experience research is a direct result of these changing trends. Although standard online surveys can capture the basics of a customer experience, tracking the entire customer journey in a way that is easy to analyze and react to is now the gold standard for customer experience research. Successful feedback and tracking programs are heavily baked into the business culture. Designated roles and tasks are assigned to ensure every customer journey has a positive outcome. Customer experience is accountability in action. From presales to post sales, it is important to understand the level of engagement customers may want to have with you. This includes knowing when and where they are looking at information, who are they talking to, which networks they may be a part of, etc. Depending on your business, some of these suggestions may feel intrusive, but some may make perfect business sense. Any time direct interaction is made is a perfect way to track experiences to determine the next steps for the customer and the appropriate action for the organization to work on. From a technological standpoint, it's important to know the perfect touch points for feedback. Mobilize the conversation by in delivering feedback opportunities to track in-the-moment experiences via smartphones and use frontline workers to capture qualitative feedback. Do you track what people are saying about you on Google reviews or Yelp? Checking it periodically doesn't count. When customers are free to use open platforms to share their experience via words or video, a proper cx program will include monitoring peer review sites as well as other experiences other than post-purchase transactions. Both have equal impact on revenue. A great example is Starbucks closing 8,000 stores for racial bias training. Folks didn't have to buy a latte to form an opinion on this situation, but it is equally important for Starbucks to address this properly for the sake of its global brand and long-term revenue projections. A while back, some friends and I were driving through Provo, UT on the way back to Washington state when our car stopped working. We didn't know anyone in town and started calling all local auto stores to see who could help us figure out what to do. We happened to call Les Shwab when the manager was about to close the shop, and he drove out to our car on the side of the freeway, found what was wrong, and immediately fixed it within 45 mins. What a miracle! Later, I found that Les Shwab has the policy to help customers to the best of their ability no matter the situation. This manager made a lasting lifelong impression on me. It's important to remember that no two journeys are the same no matter how much you want to anticipate expected reactions and outcomes. This as an opportunity to deepen your relationship and create a meaningful experience that can have lasting impressions. Being able to identify customers who can enjoy offering feedback would make for a great opportunity to create an online community or panel. Feedback in exchange for exclusive engagement experiences while ensuring a positive customer journey is a win-win for both the panelist and your organization. Look for tools like SurveyAnalytics that can support a customer experience program and integrated online communities. Data doesn't make sense unless it tells a sensible story to the people who want to read or hear about it. An NPS score of 15 in 2017 vs a 4 in 2016 will mean nothing unless you supply context and supportive visualization tools. What if in 2016 you had 100 customers, but in 2017 only had 70 customers? Even if the NPS grew year or year, there is an area of failure that must be addressed. As market researchers, it is our job to interpret and deliver impactful reports that make it easier for decision-makers to do their jobs. When we spark a reaction, then that means we told the story well. Find a customer experience tool that allows you to build customized reports that automatically trigger actionary steps for various teams within an organization. To learn more about the customer experience program, contact SurveyAnalytics to get started today. QuestionPro Audience, a division of SurveyAnalytics and QuestionPro that specializes in research and data collection, has released its latest research study: “2018 Home Renovation Report: Homeowner Trends, Spending and Priority Projects”, a look into homeowner renovation plans. The 2018 Home Renovation Trend Report reveals that spending is on the rise, and women are taking the lead when it comes to conducting household renovations. 55% of homeowners plan to do at least one home improvement project over the next twelve months, up from the 38% who have conducted previous projects. Women, in particular, are looking to perform home improvements in the next twelve months, with 51% planning to spend between $1,000 and $5,000. What’s more, our study found that 54% of women are paying with cash, compared to 40% of men. QuestionPro Audience’s latest study takes a look at homeowner spending behavior and renovation trends. The infographic provides an in-depth look into homeowners who plan to do an improvement project during the next twelve months, how much they’ll be spending, and if they plan to hire a contractor or DIY, among other insights. For any brand, across any industry, a logo is more than just a graphic – it is the symbol of the organization that plays a critical role in brand recall and messaging. We at SurveyAnalyticsunderstand the significance of this consistent brand messaging, and this includes creating and sending surveys that are customized with the survey creator’s brand logo. After all, customer and consumer outreach efforts using surveys play an important role in informing respondents that your brand cares about their opinion and feedback. An effective way to brand a survey is to embed an organization’s logo in it, which will unmistakably communicate to the respondents that a specific organization is conducting the survey. An “Add Logo” button will appear. Click on it. 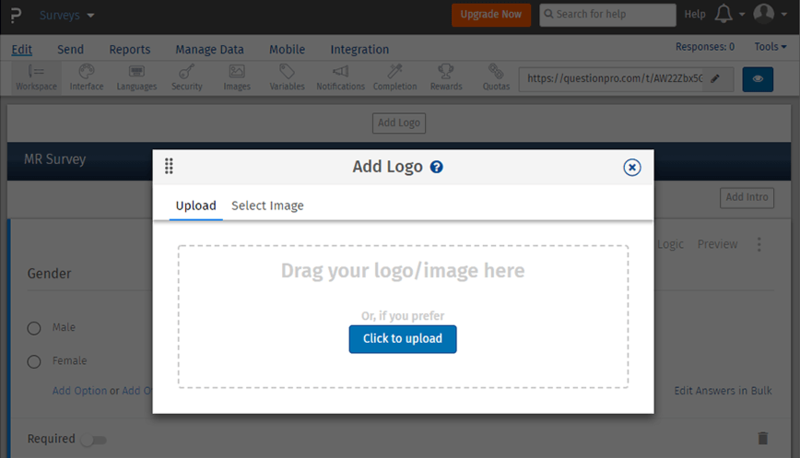 Step 2: On clicking “Add Logo”, a popup will open. Upload or drag and drop the logo/image file. 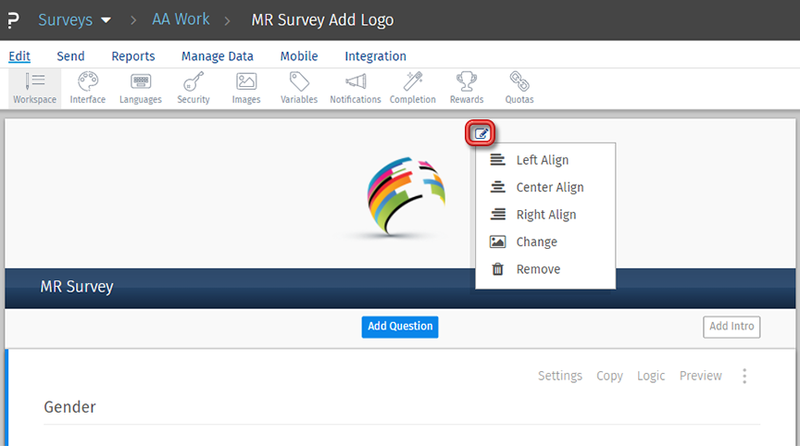 Step 3: After uploading the image, it will appear on the survey and is usually center-aligned. How to edit or remove this image? 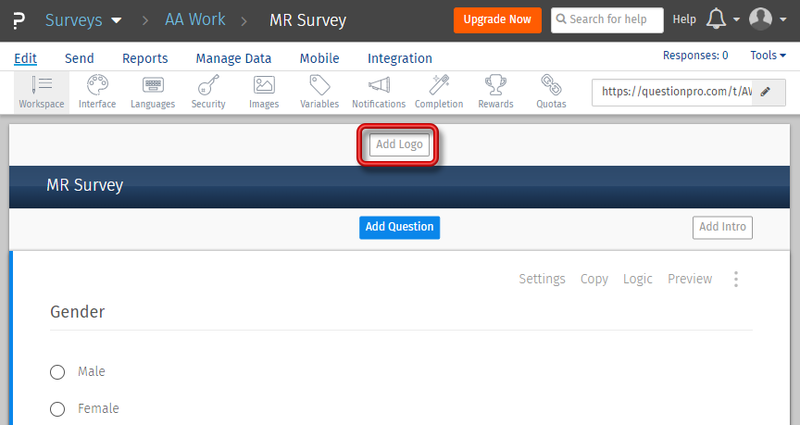 Once the logo/image is inserted into the survey, it can be edited or removed. This can be done by clicking on the drop-down which will provide options to change the alignment or remove the image. Do you often need to do comparative analysis with your survey results? We have introduced yet another feature to our already existing list of features in cross tabulation to make it even better. The cross-tabulation tool allows you to measure the interaction between two questions (variables). The table will only show respondents that answered both of the questions, meaning the frequencies shown may differ from a standard frequency table. The cross-tab report will also show Pearson’s Chi-Square Statistics, which shows the level of correlation between the variables using the chi-square, p-value, and degrees of freedom. Select a row question and a column question from the respective dropdowns. The cross-tab table will be generated, along with Pearson’s Chi-Square Statistics and a Significant Cells for both questions. 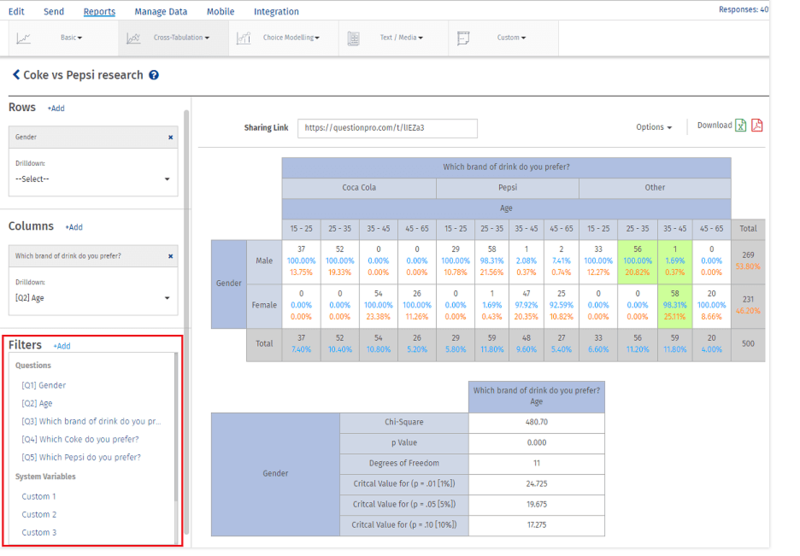 SurveyAnalytics has opted cell comparison technique for highlighting the most significant cells i.e. SurveyAnalytics consider the effect of other variables on the variable we study and see if there is any change in the percentage derived. Method opted for the calculation is column/cell comparison technique. The cell highlighting option will only work if our Chi-Square Test confirms that there is an association between parent variables. The highlighted cell would signify that the shown percentage is most significant when compared to other observation(It need not highlight the cell with the highest percentage). This test will only confirm the cell is most statistically significant i.e. it is not affected by other variables and the percentage has not occurred as result of random chance variation. You can share the report using the sharing link. The new crosstabs feature is available on Saturday, April 14, 2018. Should We Worry About Hot Trends in Market Research for 2018? A recent article from the American Marketing Association pinpointed nine trends in market research to look out for in 2018. The overall feedback from fellow researchers and marketers were mixed - a bit of excitement and fear of the unknown. How is this going to affect the work we do today? Are we going to see similar changes that hit our industry during the recession in the mid to late 2000s? As someone who was a market research manager and lived through the recession that wiped out many market research organizations, including the one I worked at, I completely understand the fear. It is hard to trust technology when you feel like it is gunning for your job. With Amazon leading the way, more and more companies are giving customers a seat at the business table. I don’t see this changing anytime soon. Automation to deliver and gather feedback is incredibly popular, and a preset course of action allows organizations to handle experiences in the moment - far better than waiting for an email response weeks later. If you are an organization concerned about your customer’s experience and need better ways to be proactive, then it is time graduate from the standard survey for feedback and consider a CX solution. However, a solution is only as good as the team properly implementing it. CX solutions need smart folks with market research backgrounds to set up and drive results that are actionary in nature. This is your opportunity to specialize in this particular niche. Automation will affect the market research industry. There’s no doubt about it. People who need data to review will need it quickly and in a simpler format than what is traditionally offered. Simple- Digestible - Actionable are three characteristics that predictive analysis must be in order to work. But who is going to be there to set this up and validate the results? This is the value that research analysts, data scientists, and market research managers can offer. The growth in popularity for predictive analysis is only going to make validation research more important in the future. As you can see in the recent Facebook privacy scandal, learning about people has been and will always be extremely important for businesses to better target their messaging for products and services. AI and other learning tools are already smart enough to know what websites I visit and that they use my Instagram feed to continue advertising to me. A bit creepy if you ask me, but this is the world we are headed towards. Recommendations when online shopping and Netflix viewing habits all culminate into getting a relative idea of who you are without asking you any direct questions. As the world continues to demand customized experiences, organizations will continue to look for passive ways for businesses to interact with you through intelligent design and machine learning. The biggest area market researchers can influence the growth of AI and machine learning is setting best practices and standards for ethical data collection and storage. We are already seeing GDPR being enforced in the EU this coming May, and I believe this is going to eventually become a global issue that organizations like the American Marketing Association or Market Research Association could take on and be the voice of ethics when it comes to protecting every citizen's privacy. After reading these, are you panicked or are you hopeful? For me, I’m hopeful because many of my colleagues and I were able to evolve and flourish after the last recession and technological overhaul in the market research industry. I strongly believe that will happen again, and I love the idea that market research has a future influencing much of the technology that will be implemented soon. There will always be a place for traditional market research methodologies, and who better than us to mix something old with something new? We all should be mindful and continue to grow and learn how to adapt with resiliency to the evolution of changing technology. Companies who are invested in new ways to gather insights will be even better off when you are able to embrace changes while adding your expertise to the mix. Data is only valuable when it is relevant and applicable to the person reviewing it. When it comes to implementing a successful employee engagement program, tracking the results requires multi-level management buy-in and long-term advocacy from the groups who must review the results. 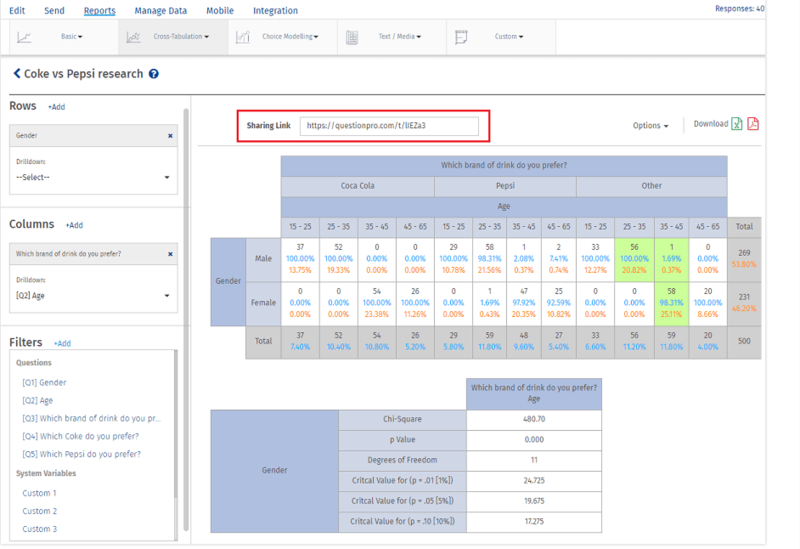 If the department or regional sales manager cannot easily see data that apply to their particular team, then they will have no problem telling you this isn’t valuable and that it won’t help them build and retain better work teams in their future. 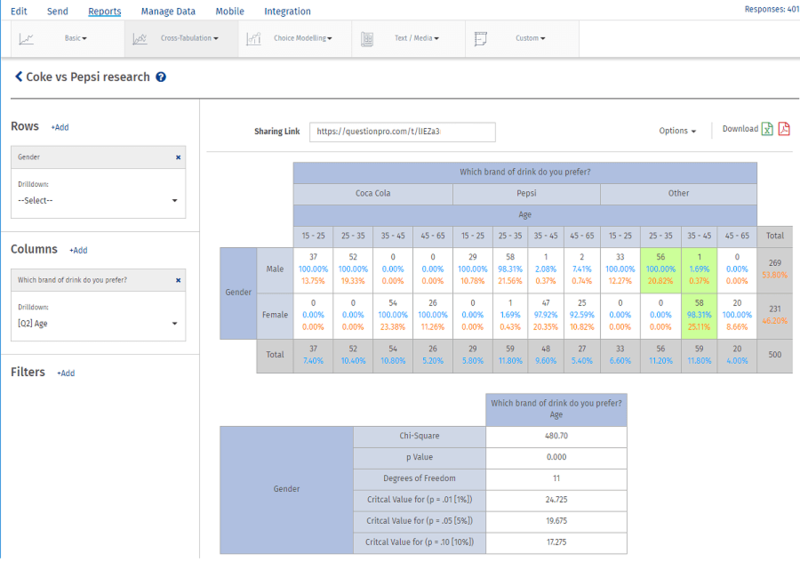 SurveyAnalytics' Workforce dashboard filter will allow Workforce administrators and various team managers to filter and review particular questions from the 360 survey. This will give the head administrator the ability to deliver data that is most relevant to the right folks that can benefit and use it for important team and executive decisions. The Dashboard Filter offers real-time filtered data from the results collected from the employees. This data is based on the criteria selected by the Workforce administrator. The administrator will be those assigned to Workforce account which may include human resource managers, team or department managers, executives, internal market research analysts, and or outside consultants. 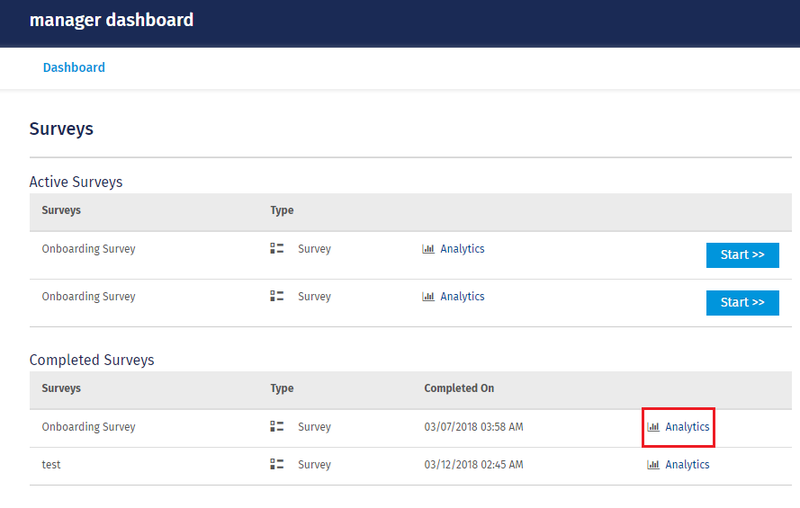 Administrators can use the dashboard filter tool on Workforce’s analytics tab to filter the data based on Employee Fields and/or Questions. After the filters have been applied, you may choose to download the filtered data after the selection has been made. ‘Filters’ will open a box of options for the administrator to select. Under ‘Employee Fields’ you can select Role, Team, Location, Type, etc. Under ‘Questions’ you can select the questions added in the survey. These selections chosen will then be applied to the real-time workforce dashboard and can be downloaded for external delivery. For more information on our employee engagement program, visit Workforce on our site and contact us here and we can walk you through best practices and tips to get your organization started today.